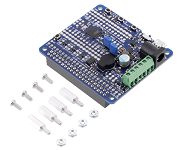 The A-Star 32U4 Robot Controller LV with Raspberry Pi Bridge is a programmable module well-suited for robotics applications. The Raspberry Pi 3 Model B is the latest generation of single-board computers from the Raspberry Pi Foundation. Upgrades include a faster 1.2GHz ARMv8 64bit processor and built-in WiFi and Bluetooth functionality.